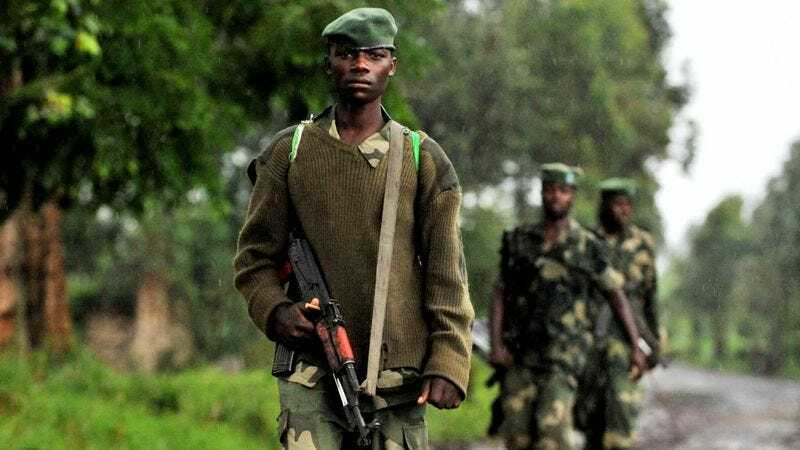 GOMA, DEMOCRATIC REPUBLIC OF CONGO—While he admitted to having heard mentions of the bloody uprising and grave humanitarian crisis, Congolese rebel Emmanuel Muamba, 26, told reporters Thursday that he is having difficulty taking any real interest in the country’s ongoing insurrection and has “pretty much tuned out” all references to the conflict. “I vaguely know there’s something going on between government forces and insurgents, but frankly, I just find myself not caring about it at all,” said Muamba, admitting he probably wasn’t as informed as he should be about the details of the recent war atrocities he had committed or the plight of the child soldiers fighting alongside him. “I know I ought to pay attention, and I genuinely feel bad about my apathy toward what’s happening, but at the end of the day, it’s just another violent conflict in Africa, you know? I just can’t keep up with all of them at this point.” Reached for comment, all of the villagers that Muamba was currently massacring echoed the rebel’s total disinterest in the African nation’s continuing political strife.